The DNSODM204_USB is a SODIMM module that can be installed in a 204-pin DDR3 SODIMM socket on FPGA-based ASIC emulation products from Dini Group. This module adds USB2.0 physical layer functionality, allowing easy and cost effective prototyping of USB IP. 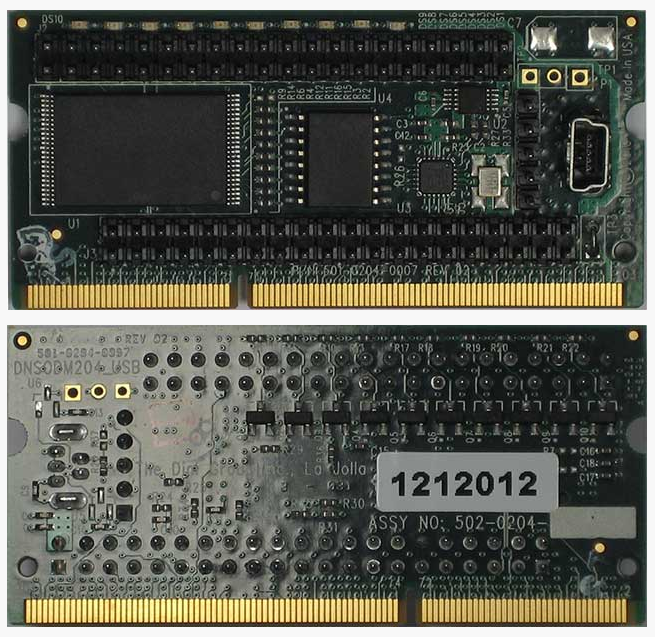 This module also contains a 48-pin TSOP socket for a NAND Flash memory, a 128Mbit serial flash memory, and two 40-pin IDC headers for off-board I/O. Ten (10!) green LEDs can create enough illumination to peel paint from your lab walls or provide valuable visual feedback to your debug process. A USB3317 from SMSC provides the USB2.0 transceiver functionality. The SMSC3317 contains On-The-Go (OTG) functionality that is fully compliant with Universal Serial Bus Specification Rev. 2.0, On-The-Go Supplement to the USB 2.0 Specification Rev. 1.2 and UTMI+ Low Pin Interface (ULPI) Specification Rev. 1.1. The SMSC3317 can transmit and receive USB data at high-speed (480 Mbit/s), full-speed (12 Mbit/s) and low-speed (1.5 Mbit/s) and provides a physical layer front-end attachment to USB host, peripheral and OTG devices. A MINI-B connector is provided, so no odd or custom cables are required. This isn't the most mechanically stable of solutions, so be careful of the stress the USB cable puts on the board when mounted in the SODIMM socket.